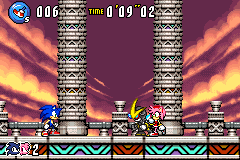 Altar Emerald is the regular final zone in Sonic Advance 3, which the player immediately travels to after defeating the Egg Gravity and clearing Chaos Angel. Once this zone has been reached, it can be accessed again via Chaos Angel's Zone Map by moving just a bit further past the Boss Capsule and finding the Final Zone Ring. This zone is similar to Death Egg Zone in Sonic 2 in that instead of a full-length platforming level, it's simply a straight path with two back-to-back boss fights (with rings, this time). Said bosses are Gemerl and the Hyper Eggrobo. After beating Eggman, if Sonic is the lead character and all 7 Chaos Emeralds have been collected, Gemerl will go rogue and harness the power of the Emeralds, thus the true final zone will appear, Nonaggression. If not, the normal ending will play in which the heroes attack Eggman, but the scientist escapes along with Gemerl, followed by the Master Emerald restoring the planet to its original state. Since the Master Emerald is found here, this area must be located on Angel Island, and presumably represents the same place as the Emerald Shrine in Sonic Adventure. The music that plays in this zone is a remix of Holy Summit's theme from Sonic Battle. This page was last edited on 3 March 2018, at 19:14.